https://blogs.fangra...d-in-the-rough/ Nice article about Niko playing pretty well with Detroit. As Nick wrote about tonight, it’s hard to know what to do with Byron Buxton for the rest of the 2018 season. The Twins aren’t going to the playoffs and the young star has struggled to stay healthy after showing signs of breaking through in 2017. He came back off the disabled list for Rochester on Tuesday. Was he able to leave his mark with the Red Wings? Byron Buxton wasted little time making his presence known in the Rochester line-up. He made a tremendous double play in the bottom of the fourth inning before cracking a three-run home run in the top of the fifth. He ended the night by going 3-for-5 with four RBIs and two runs scored. Buxton wasn’t the only bat with a strong showing in the line-up. Kennys Vargas reached base four times including a three-hit effort. He added a double and drove in a pair of runs. Nick Gordon finished 2-for-5 with his 13th double and a stolen base. Juan Graterol also had two hits and scored two runs. On the mound, Stephen Gonsalves continued to pitch well. He tossed six shutout innings by limiting the Clippers to three hits. He struck out five and walked two on the way to his ninth win. DJ Baxendale pitched a pair of scoreless innings by striking out two and walking one. John Curtiss finished the shutout as he allowed two hits and had one strikeout in the final frame. The Lookouts matched the Braves with six hits but the team committed two defensive errors that impacted the final outcome. Tyler Wells allowed two runs in the first frame but he settled in nicely from there and didn't allow another run. He finished six strong innings by striking out seven and walking only one. Devin Smeltzer saw one unearned run score against him as he struck out three in two innings of work. Zander Wiel and Jaylin Davis each reached base three times as part of multi-hit games. Brian Navarreto and Luis Arraez both went 1-for-4 with Navarreto scoring the team’s only run. Overall, the team left 11 men on base and went 1-for-5 with runners in scoring position. Runs were certainly not at a premium in this one as the teams combined for 25 runs on 29 hits including six home runs. Mark Contreras led the offensive charge with two home runs and five RBIs. 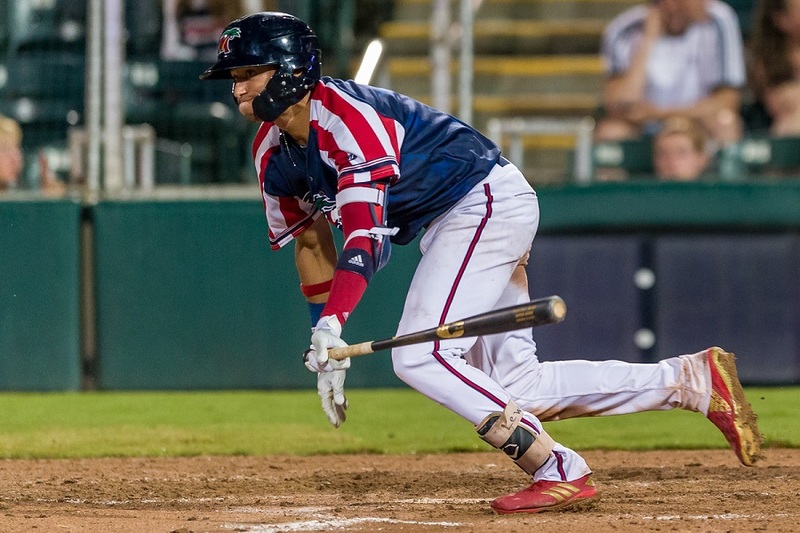 Royce Lewis had two hits, a home run and a triple. Alex Kirilloff and Jose Miranda both went 2-for-5 with a home run for each. The mound was a mess for the Miracle. Clark Beeker got hit around to the tune of seven runs on nine hits in less than three innings. Colton Davis stopped the bleeding even if it was only temporary. He allowed one run on two hits over three innings. He struck out four. Alex Robinson had some control problems as he walked three batters and allowed four runs on but gave up only one hit. Ryan Mason and Hector Lujan combined to allow only one run over the final 2 2/3 innings. Cedar Rapids had a tough time stringing hits together as the club was held without an extra-base hit. In fact, the Kernels had only three opportunities to bat with a runner in scoring position. First-round pick Trevor Larnach went 1-for-4 and added an outfield assist. Trey Cabbage finished 1-for-3 but struck out twice. Tyler Watson took the loss after allowing four runs on four hits in 4 2/3 innings. There were some control issues as he walked five batters but he also struck out five. Jose Martinez surrendered one run, a home run, in 2 1/3 innings. Derek Molina finished the game with two scoreless innings and he racked up four strikeouts. Elizabethton pitchers combined for their fourth shutout this season. Luis Rijo pitched into the seventh inning (6 2/3 IP) without allowing a run. In fact, he hasn’t allowed a run yet in the Twins organization. Pedro Garcia finished off the game by allowing only one hit in 2 1/3 innings. Every batter in the E-Twins line-up collected a hit. Albee Weiss and Ricky De La Torre each went 2-for-4 and Weiss added his fourth double. Jean Carlos Arias had one hit, a triple, and came around to score a run. Alex Robles and Colton Burns each reached base two times. The GCL Twins struggled on the offensive side of the ball by being limited to three hits. Gabe Snyder and Hunter Lee each reached base twice. Estamy Urena and Charles Mack both went 1-for-5. No one was able to collect an extra-base hit and the team went 0-for-9 with runners in scoring position. Regi Grace started but was pulled in the first inning after allowing two runs on two hits. Andrui Marin pitched 4 1/3 innings and struck out four while walking one. He allowed one run on four hits. Casey Crosby and Steven Cruz combined for three shutout innings to end the game. 10. Zack Littell (ROC): Did not play. 14. Lewis Thorpe (ROC): Did not play. 19. Jacob Pearson (CR): Did not play. Please feel free to ask any questions about Tuesday’s games, or ask any questions you may have. First off, it’s time Stephen Gonsalves gets a long look at the MLB level. He’s pitched well enough (and over all better than Kohl Stewart) to deserve a longer look in the Twins rotation. Secondly even in a loss I am still excited about what Tyler Wells can potentially do for the Twins in the rotation in the next yr or two. It is said the jump from A+ to AA ball is the biggest, well...Tyler Wells is looking as good if not better since his call up to Chattanooga. I can’t wait to see Tyler pitch next season as he gets closer to his Twins debut, in fact I think there’s an outside chance Wells debuts for the Twins as a September especially if he keeps up what he’s doing now. BB% (7.0)and K% (24.2) could stand to improve by a bit and his BABIP of .392 could indicate some regression, but still, some good production at the plate. BTW, his K% at double-A Chattanooga is the best of his professional career and has gone down each and every year from a high of 44% at E-Town in 2016. I only say "quietly having a very solid season" because he rarely gets mentioned in the same breath as the top hitting prospects in the org, but that may change here soon if this keeps up. Yup. But those 2 walks. So terrible. That would be insane to see Wells get a September call up, but doesn’t he have to be on the 40 man? I would think he’s a shoe in for AFL and even a major league spring training invite. Anyone agree? I looked at his numbers and they are among the top 10 in all of minor leagues. Whip being probably the best in the entire system of all teams with that many starts. I’d love to see him, Kirilloff, and Lewis in Arizona and Big league camp. They simply deserve a shot to be tested. Jaylin is another great mid round pick up. Some scouts are gonna get a raise. Wells was drafted in 2016, so he doesn't need to be added to the 40-man until after next year.Expect that eliminates any chance he is called up this September. Gotta believe Gonsalves has cemented his name on the list of September call ups. Bigger question is whether or not he gets any starts? With less than 20 games remaining, Fort Myers and Cedar Rapids need winnings streaks...stop these nights where both are losing. Highlights of the night for me were good games from De La Torre and Miranda.And add Byron Buxton to that list.What a night for him getting back into the 'swing' of things.Let him play every other day for a week before getting regular work for a week before the season end and his call up to the Twins.They really need this guy anchoring that outfield...on to 2019! Did any one mention Thorpe to start at AAA.Good Luck, we need the pitching. I would rather get Mejia back in the rotation at this point. It's time we figure out if he is going to be part of the rotation for the next few years. He is still just shy of 5 walks per 9. It's great to see this coming around but it is a bit early to proclaim he now has the command necessary at the ML level because the last handful of starts have been better. Sure, it would be entertaining for us all to see him but is it best for his development. If in fact they are seeing great strides in his command right now, I have no problem with them keeping him at AAA until their season is done if the coaching staff believes he is going through a critical stage in commanding his pitches. We are all clamoring for better development. Maybe that's happening with Gonsalves. While I am super excited of Wells’ success in AA it has been in 3 games (2 starts). I have to believe he will finish the year in AA, if all goes well and he continues to look dominant I have to think he will be promoted pretty quickly next year to AAA with a September call up next year. I agree though that he should get a look in the AFL, it could be a good stage to help catapult his prospect status for next year. I like Gonsalves but let's slow down a bit. His upside is probably a #4 type, similar to Mejia. He's walking nearly 5 guys per 9. He can't pitch deep into games - he's averaged less than 6 innings in his last 10 starts, for instance. It takes him 100 pitches to get through 6 innings in AAA. Right now, ML lineups will sit back, make him throw strikes and it'll make an Odorizzi start look fast. I was at the game last night in Columbus. Easily overlooked in Buxton's box score after a 3 for 5, 4 RBI (no k's) night was his ordinarily spectacular fielding. He ran down a drive to deep left-center that would have scored two and kept Gonsalves' ERA over 3. Bring him up in September, and offer a team-friendly extension in the off-season. Now is the time to buy low on Buxton. BTW: Huntington Park is awesome! You would not need to worry about him staying in shape or giving 100% because he signed a guaranteed deal. Very intriguing idea. I am just don't think he sells (so to speak) when his stock is so low. He needs to cut down on his BB and get deeper in games. He's having a fine year, and there's no doubt he'll be contending for a spot in the rotation next year but he's not a slam dunk. He doesn't have the kind of electric stuff that makes him a slam dunk, and his command/control is going to need to be strong in order to thrive. I expect he'll get a shot as a Sept callup. I don't know that it would help his development any to move him up any faster. Maybe coming up now for a start and getting shelled as the walks kill him would help him refine his approach and buckle down on that area, but I kinda doubt it. Without overpowering stuff and pretty bad BB numbers I have a feeling Gonsalves gets slaughtered in the majors.Sometimes the team has an idea what they're doing, much like we all thought Berrios was more than ready a few years ago only to get pounded when reaching MLB.That said, maybe bring him up in September and pitch him in some low-leverage situations to give him an idea of what he's up against and what he needs to work on.